Fill your board with Legendary minions. 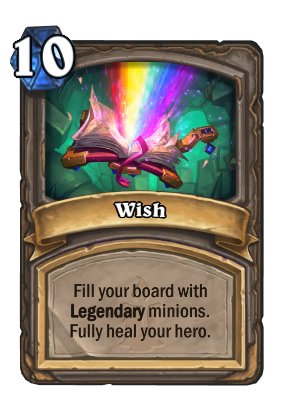 Fully heal your hero. The one time that I used wish happened to be against the final boss, and the wish happened to summon both Dreadscale and Acidmaw. I feel like I'm playing DND, and the DM is using my own warding in the wish against me. I had Xol down to <30hp with no cards in hand and no board. My own board wasn't great, but the three or so minions that I had at least were on the board. I had 4 hp myself and a Wish in hand. I thought it was a home run. Unfortunately Xol topdecked a Soulfire... so close.